Lady in the Moon is one of several examples of Terri-Lynn Williams-Davidson’s use of her own image in her work. Terri-Lynn Williams-Davidson inherited an important gift and responsibility from her great-grandmother. Susan Williams was a Haida song custodian who knew more than 100 songs – a tremendous feat considering the devastation brought to the Haida and their language by smallpox and cultural oppression. Born in the village of Skedans and relocated to Skidegate in 1896 (after smallpox, the Haida were concentrated into two communities – Skidegate and Masset), Williams worked to keep the language and music alive as most of the population perished. She lived to be 109. Williams-Davidson, who was about 5 when Williams died, has also made preserving Haida culture her life's work. An award-winning musician – and legal counsel for the Haida Nation – Williams-Davidson is now making her first foray into visual art with a new show at the Haida Gwaii Museum at Kay Llnagaay. Out of Concealment: Female Supernatural Beings of Haida Gwaii actually began as a music project (there is a complementary album, as well as a book, both to be released in August), but again and again, Williams-Davidson kept returning to the question: What would these female supernatural beings look like today? In each photo, such as White Raven Bringing Light To The World, Williams-Davidson’s image is set against plate images of specific locations referenced in oral narratives with other relevant components. "We don't have any visual reference points for them other than abstract representations of them by artists such as my husband," says Williams-Davidson, who is married to acclaimed Haida artist Robert Davidson. "So that was sort of the idea for why I wanted to visualize them. But also because I have grandchildren who talk about Disney princesses and are enthralled with magical powers, but for the most part most kids don't know about these female supernatural beings. And I really wanted to be able to provide a visual reference for them." The show – more than 30 works including photo collages, lightboxes and video as well as one ink-on-silk work – depicts contemporary versions of female Haida supernatural beings and crests. Researching through oral narratives and ethnographic records and drawing on her experience as a Haida dancer, Williams-Davidson – whose Haida name is Gid7ahl- Gudsllaay Lalaxaaygans – created visual representations of these figures and their stories. For instance, a butterfly that survived glaciation figures into the Ice Woman ( Kalga Jaad) story, so Williams-Davidson researched what type of butterfly might have survived glaciation and included images of that butterfly in the photo collage. 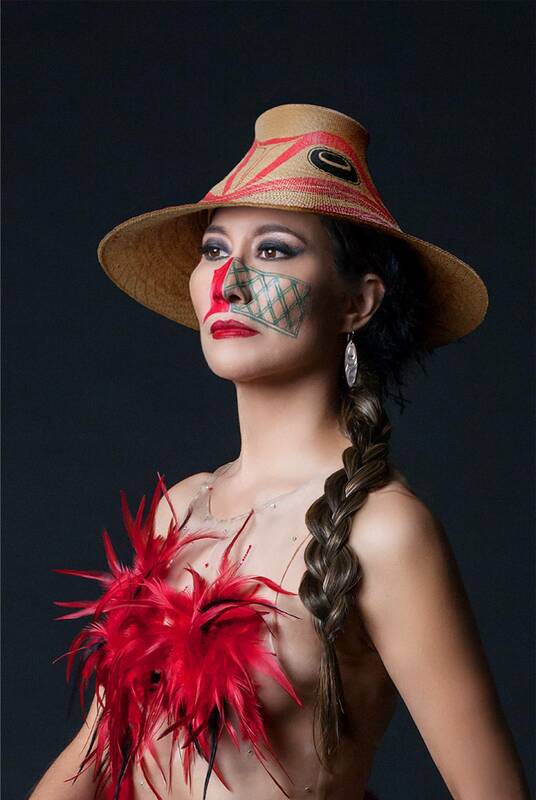 She uses her own image in each work, casting herself as Salmon Woman (Chiina Jaad), Octopus Woman (Naw Jaada), Cedar Sister (Ts'uu K'waay Ga), Lady in the Moon (Kuu.ngaay Ga Nang Jaadas Is) and many others. In each photo, her image is set against plate images of specific locations referenced in oral narratives with other relevant components. She is dressed by Indigenous designers (including Himikalas designer Pam Baker, Cree/Métis designer Angela DeMontigny and Navajo designer Orlando Dugi), almost always in contemporary fashion rather than traditional garments. "I want to connect with people of today," Williams-Davidson says. "I want people to believe that these supernatural beings exist today. They're not something that only exists in ceremonies or in another time." Each work also contains a piece of Robert Davidson's art depicting supernatural beings. "I kind of ghosted them in subliminally," she says. "Mostly because it's his art that has depicted supernatural beings and I wanted to make the connection to how people have seen these supernatural beings and crest figures. And besides, he does such beautiful art, how could I not incorporate it?" There is also an audio component; the show has been programmed for motion activation so that the song that draws upon the oral history for Foam Woman (S Guuluu Jaad), for instance, will play as the viewer approaches that particular work. The video depicting Grizzly Bear Woman (Xuu.ajii Jaad) includes an archival recording of one of her great-grandmother's songs. And there is certainly a message to this exhibition: that our world is not simply an inanimate landscape "to be exploited, but actually is a human landscape," she says. "We view these supernatural beings in each of these places and that changes how you interact with the environment – if, for instance you're dealing with your Cedar Sister instead of a tree that is so much pulpwood or whatever it might be. I want people to think about the landscape differently, think about the ocean differently." Curator Nika Collison calls the show a "critical, original and wondrous iteration of ancient histories and wisdoms" in her curatorial statement. "There would be very few people who could dive into such a depth of exploration within such a world in which you have to be so careful," Collison says, unpacking the works at the museum ahead of last Friday's (June 16) opening. "We feel privileged that we can still have this information passed down." Out of Concealment: Female Supernatural Beings of Haida Gwaii is at the Haida Gwaii Museum at ­­Kay Llnagaay in Skidegate, B.C., until Dec. 31 (haidagwaiimuseum.ca).